"Tell Me A Story About..." Baby Shower Game. Everyone invited is sure to know something special about the soon-to-be Mommy, Daddy or Grandparents! This fun baby shower game asks guests to share their fond memories of the baby's expectant family. Here's what you do: hand out the sheets to all your guests with your own pens or pencils. Ask your guests to write in the parent or grandparent's name on the sheets provided. Now your guests are ready to write their own special story or memory! Ask the "Mommy to Be" to read all the stories. Her favorite story wins! Be sure to have a shower prize on hand for the lucky winner! Have a little fun with this shower game! Be sure to ask her to read the stories out loud for everyone to hear. Your guest of honor will enjoy reliving (or maybe hearing for the first time!) these sentimental memories and may want to keep these sheets in her scrapbook! 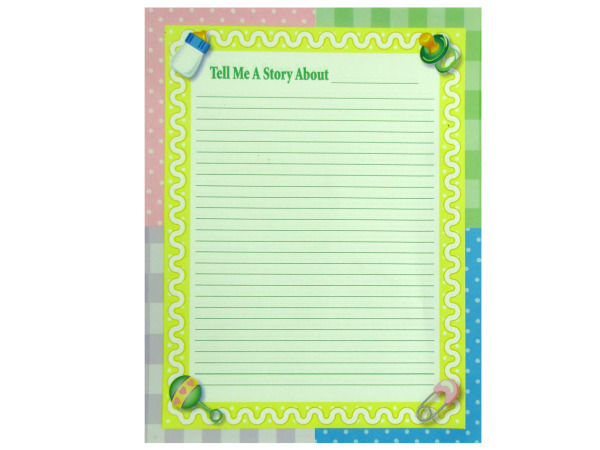 Includes 2 dozen illustrated "Tell Me A Story About..." game sheets. 8 1/2" x 11"
This item is a closeout. 24 pcs. 48 pcs. — — 72 pcs.